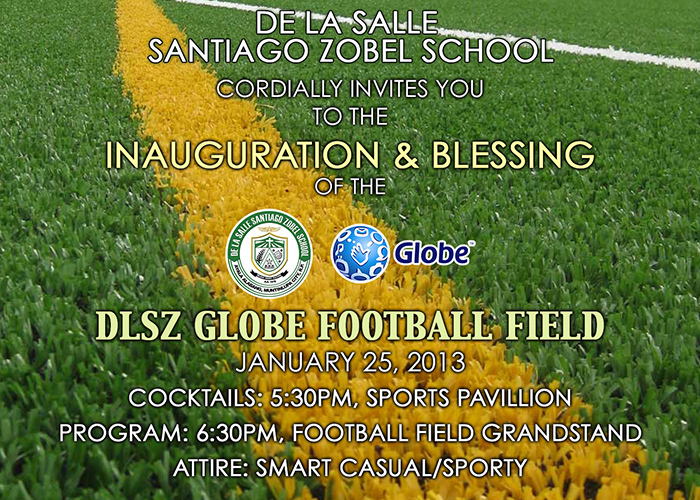 Alabang, Muntinlupa – Subsequent to the signing of the Memorandum of Agreement for Globe Telecom, Inc.’s sponsorship of an All-Weather Artificial Turf for the DLSZ’s Football Pitch, is the inauguration and blessing of the DLSZ Globe Football Field last January 25, 2013 at the Football Field Grandstand. Mr. Alberto De Larrazabal (Chief Financial Officer of Globe), Br. Dennis Magbanua FSC (President of DLSZ), Mr. Ramos Garcia (Team Manager, Green Archers United Football Club), and Br. Jose Lazaro Rodriguez FSC (DLSZ Animator) unveiled the two Globe logos imprinted on the football field. Cocktails were served at the DLSZ Sports Pavilion followed by a program at the Football Field Grandstand. Expected attendees of this momentous event are Mayor Aldrin San Pedro, Globe Telecom Inc.’s exectives, Lasallian Brothers, Ayala Alabang Village officers, Green Archers United Team, United Football League officers, Philippine Football Federation representatives, Azkals Football Team Head Coach and Manager, DLSZ Board of Trustees, DLSZ Administrators, DLSZ Alumni Association, World Union of Lasallian Former Students (UMAEL) President, DLSZ Parents Association, DLSZ Parents Association-Sports Development Foundation, and members of the press. 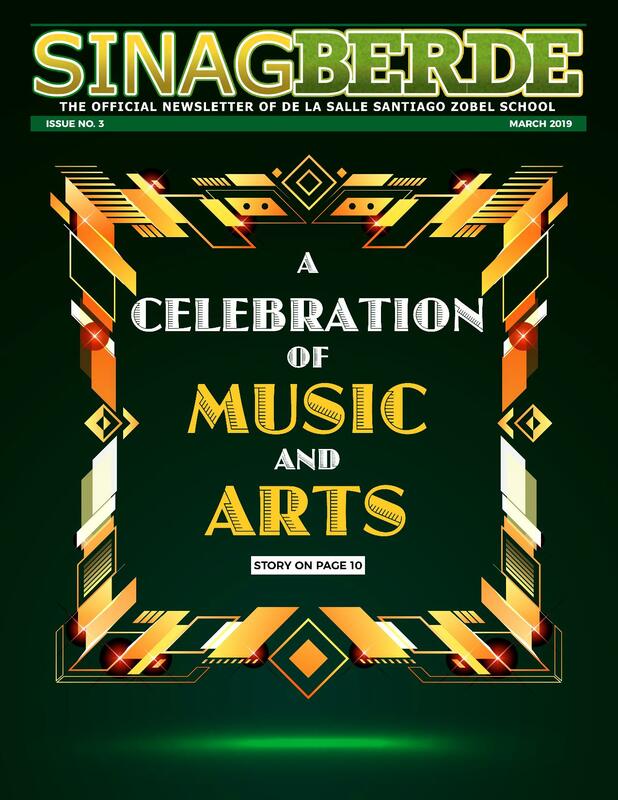 The partnership between De La Salle Santiago Zobel School and Globe Telecom, Inc. was sealed through the signing of the Memorandum of Agreement last September 20, 2012. Br. Dennis Magbanua FSC, Mr. Ernest Cu (President of Globe) and Mr. Ramon Garcia were present for this momentous occasion. 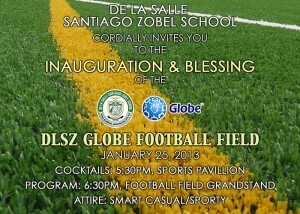 Hence, the football pitch shall now be named DLSZ-GLOBE FOOTBALL FIELD. Globe Telecom, Inc is one of the leading telecommunications company in the Philippines. Their relentless commitment to support Philippine Football is very evident with this sponsorship as the artificial turf will definitely improve the training field of DLSZ’s football players. Globe has been a strong supporter of sports teams, one of which is the Green Archers United Football Club (GAUFC). Archers in UAAP, the GAUFC was formed in 1998 and was born out of the Alabang Grins Football Club. To date, their core team is composed of La Salle alumni and other football players who may not be Lasallians but also possess the “Animo”. In appreciation of Mr. Ramon Garcia’s role in uniting Lasallian football players across generations, the school will recognize the DLSZ-Globe Football Field with the moniker, “Home of the Green Archers United”. DLSZ and its football players will definitely benefit from the replacement of natural grass with an all-weather artificial turf. Artificial turf fields can be played on in nearly all weather conditions without impact to the field surfaces unlike natural grass playing fields that face surface damages due to climate change. Other appealing features include durability and efficiency. The artificial turf’s maintenance fee is reduced to 75 percent and it eliminates chemical application and the need for additional water consumption, thus strengthening further the school’s environmental advocacy. With all these in sight, grass will definitely be greener with the addition of Globe’s blue ribbon stamp.